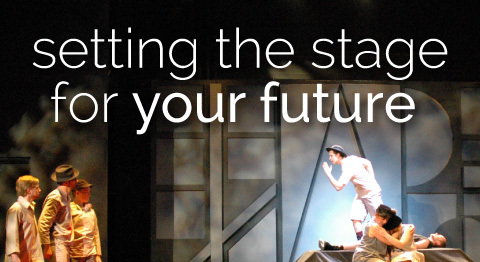 The Department of Theatre at Louisiana Tech University offers many competitive graduate assistantships and undergraduate scholarships and awards. Department of Theatre personnel will work diligently with applicants to identify opportunities for scholarship, awards, and grants. While an audition is not necessary for acceptance into the department as an undergraduate student, auditions (and/or interviews) ARE required to be considered for graduate school, graduate assistantships, scholarships, and awards. Provide a sample of academic writing, a current resume, and headshot. These can be emailed to Cherrie Sciro (lulu@latech.edu) or "snail mailed" to the Department of Theatre (Attn: Recruiting). Please note that, due to FERPA privacy laws, the Graduate Admissions Office will not release information regarding the status of your admission application to anyone other than you. Because of that, we ask that, once you have completed the online application process, please inform Cherrie Sciro so that we can track your admission process. Provide a current resume and headshot. These can be emailed to Cherrie Sciro (lulu@latech.edu) or "snail mailed" to the Department of Theatre (Attn: Cherrie Sciro). Contact Cherrie Sciro (lulu@latech.edu) to request an assistantship/scholarship application form and set up an audition/interview date.